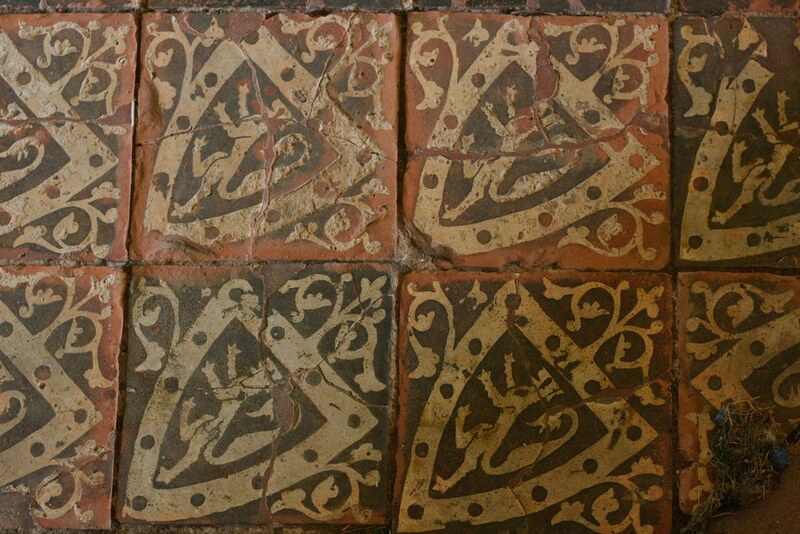 Over the past couple of weeks, images of medieval floor tiles have been appearing in my Twitter feed with a surprising regularity. 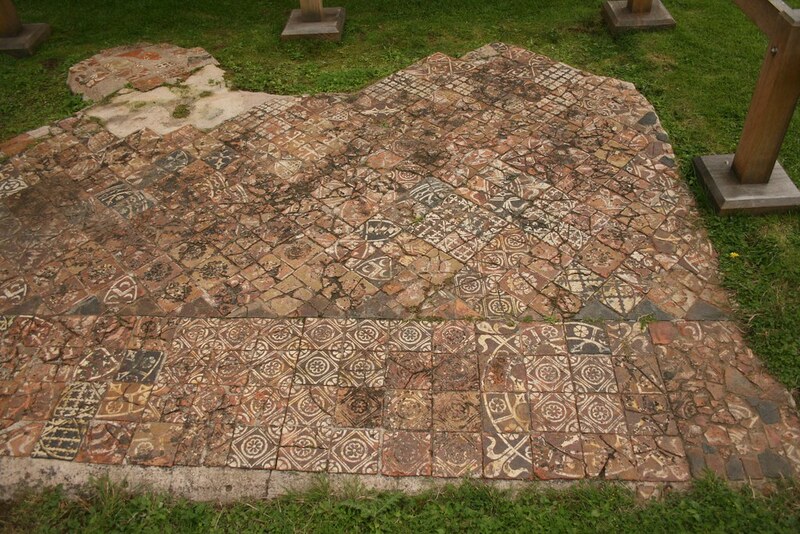 I’m fairly sure this is a mere coincidence, but maybe, just maybe, it’s the universe trying to tell me something – so I figured I’d write a post on one of Britain’s finest tiled pavements from the medieval period, the old refectory floor at Cleeve Abbey in Somerset. Cleeve Abbey is a former Cistercian monastery founded in the 12th century. Its church was demolished in the wake of the English Reformation, but most of the other monastic buildings, including the dormitory and the chapter house, are still extant. While most of them date to the 13th century, the refectory range was rebuilt in the late 15th century. However, in an open space just to the south of it, the pavement of the original 13th century refectory was discovered in 1876. Fully excavated and put on public display in 1951, it was exposed to wind and rain for several decades and has suffered accordingly… When I visited a few years ago, a kind of marquee had been placed over the floor tiles to offer at least a mininum amount of protection, but I’m happy to report that in 2016 it was replaced with a proper, state-of-the-art wooden shelter. 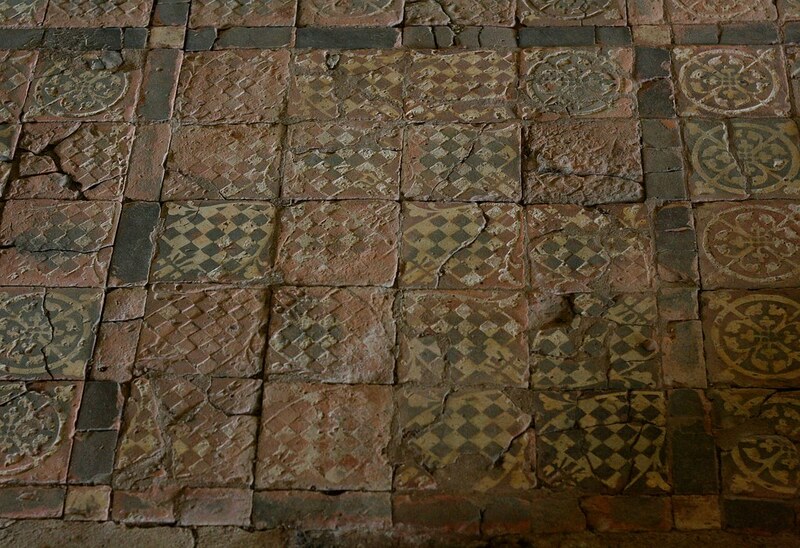 As is evident from the photos, some of the polychrome encaustic tiles have suffered quite a bit of deterioration, but all in all the floor is remarkably well-preserved. 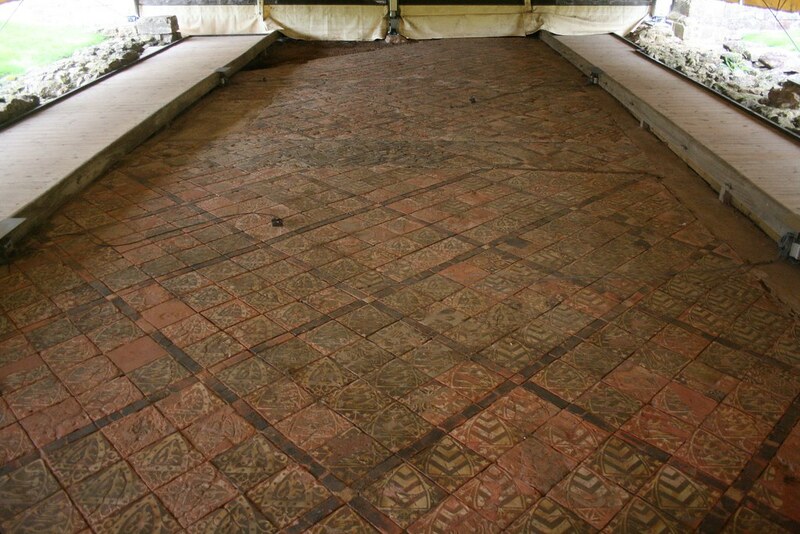 Covering a surface of approximately 4 x 18 metres, it still retains its original tile arrangement, something that is extremely rare in surviving medieval floors. 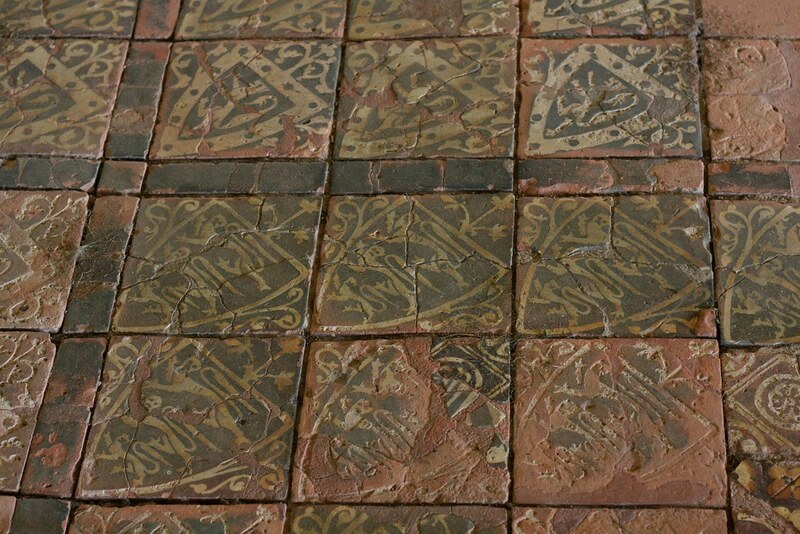 Presumably made in the 1270s by a Gloucestershire tilery, the refectory floor at Cleeve Abbey consists mainly of heraldic tiles, visualizing the abbey’s political affiliations and commemorating its surprisingly far-reaching network of lay patrons. For instance, the chequered coat of arms in the above photo belonged to the family of de Warenne who were Earls of Surrey at the time. The heraldry displayed on the tiles may have had an even more specific significance, though. It has been suggested that the pavement was created to commemorate the wedding of Edmund, Earl of Cornwall, and Margaret de Clare, daughter of the Earl of Gloucester, in 1272. 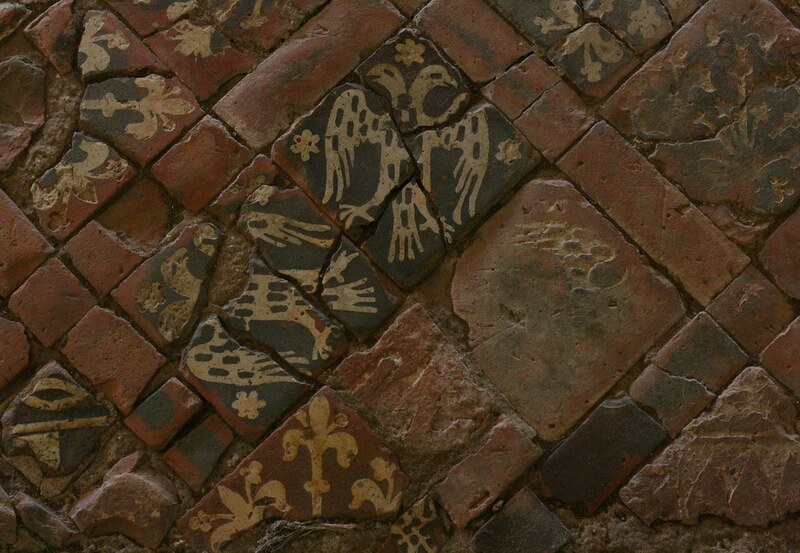 While there is no ultimate proof for this theory, it certainly seems plausible: After all, the arms of the de Clare family (pictured above) as well as those of the Earls of Cornwall (below) feature prominently in the refectory floor. Considering these fragments, it is titillating to imagine what the pavement of the abbey church may once have looked like – and painful to realise what has been lost. But even what survives is amazing enough, and the refectory floor alone is well worth a visit, even a detour if you happen to be in the area.